Minnesota Brewery Tours for true beer worshipers. If you are a big fan of beer and want to see the whole brewery process, then you should check out one of our Brewery Tour Limo packages! Brewery tours are always a fun time with friends or family. You can see just exactly what goes into the process of creating some of those famous brews. 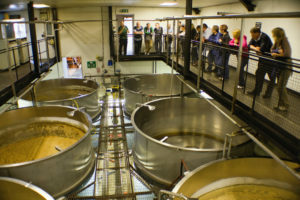 Enjoy a fun filled brewery tour and relax with your friends. You can take comfort in knowing you’ll have safe transportation when your finished. If you have a brewery tour already picked out and want 1st Class Transportation to be your safe ride back to your destination, we can easily do that. Or if you are unsure we can always give you some insight on the most popular brewery tours in Minneapolis and even all of Minnesota. Brewery tours are always great for any occasion during the day to get out and explore something new. Safety: You won’t have to worry about having too many tall boys at the Brewery Tour.You can be rest assured that you will reach your destination afterwards in a safe and comfortable luxury vehicle. Comfort: Riding in style and comfort to the tour will also help you to enjoy the whole experience even more and make it a memorable occasion. Cost: We offer highly affordable rates on Brewery Tours in Minnesota. Our rates are highly competitive and we outperform the competition in price to ensure you get the best deal around. Customer Service: We treat our customers as if they were family. Each customer has a specific need and we tailor those needs to each person. Our chauffeurs enjoy what they do to ensure you get a spectacular experience every time. On top of Brewery Tours, 1st Class Transportation also offers great wine tours & city tours if you are looking for something a little different. 1st Class Transportation looks forward to being your premier Brewery Tour Limo Service. Click book now below to start the fun!